There is something that baffles me here in the US- its love-affair with shopping- the fact that there is a ‘mall’ in every couple of miles and every mall parking lot, sometimes spanning across multiple floors, is filled to the brim. Always. All these cars, quietly await outside, forming a stifling, faceless landscape, while the people are inside, effectively caged. Oddly enough, whenever I try to imagine the exact opposite, I reel back to a roadside scene, right outside Dhaka. The road (rather street) lined with small stores, repair shops, independent vendors and – faces. Oh the glorious faces – some selling, some buying, some brawling, some getting a shave (perhaps with a side of Hep-C) and some are just spectators of the carnival. I did not realize then but I do now that I was captivated by the spirits of the concepts of local economy and livable streets- both vital for a harmonious existence with the environment. What personal action impacts these concepts one way or the other? Consumption or more precisely, the way we shop. Giant retailers, with their deceptive affordability and gargantuan foot print (both physical and ecological) have a much diabolical impact, so how does an Eco shopper navigate around this consumer landscape where the only option seems to be Wal-mart? There are a couple of alternatives actually; starting with the oft-overlooked element in the Eco living slogan-“Repair”. These days, repairing is a lost art. Granted, I myself have never mended or darned cloth or resoled shoes with my own hands but I have sought out the service and repaired my belongings whenever possible. I have gone to a knife sharpener to sharpen old knives instead of buying new (in Montreal) or repaired sandals that had served over 8 years(in Bangladesh). Besides steering away from toxic disposable culture, these acts of repairing did two things: it supported independent businesses and the concept of craftsmanship; concepts that are backbone of a strong local economy. When shopping is a necessity, ideally it would start with checking out the second hand stores. I started buying second hand when we were a student household, out of necessity. It started with buying furniture on Craigslist. Then eventually I started buying everything from plants to accessories. I shopped at thrift stores, church sales or yard sales for everything from dustpan to dining table. Most of my kitchen supplies are from thrift stores. The added benefit with shopping there is that I could buy items to mimic disposables without the disastrous aftermath- for example I’d buy glasses (mason jars) when I have more than usual number of guests and donate them back when we are back to the two of us. Thrift shopping is also great for things that keep getting lost mysteriously; like stainless steel water bottles. Despite my best effort, I’m now onto the third one. Below, left: My Montreal living room of 4 years. Everything, other than the bookshelf and the pouf, were bought second hand, including accessories like mirror, lamp and even the toaster! It was the first time I had any decorating authority over my surrounding, so I did not know what ‘my’ style was. I could safely experiment with my home decorating style and adjusted by reselling and buying again. As a renter, this flexibility was helpful. 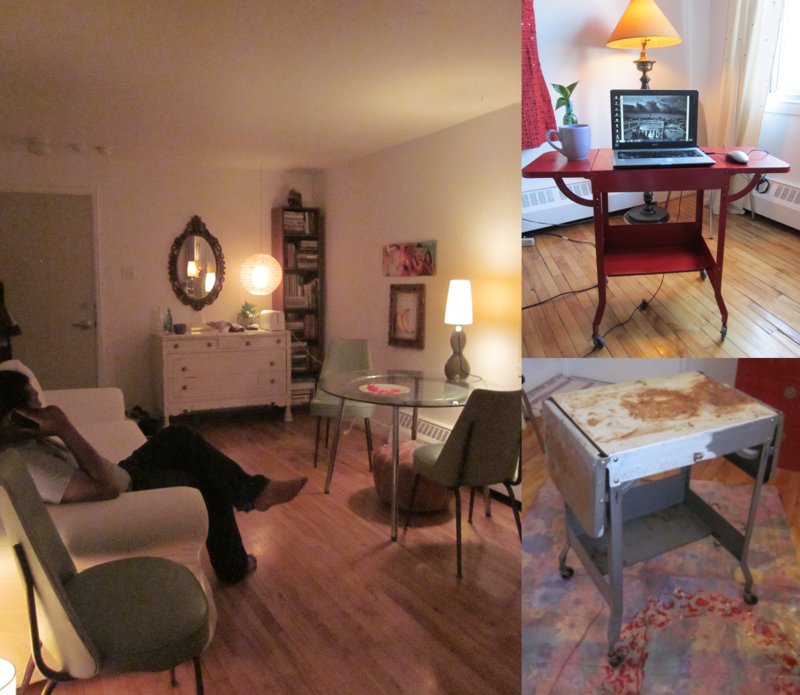 Below right: A vintage typewriter table, that I was given for free over a Craigslist ad, that I resuscitated with paint. There are a couple of limitations with thrift shopping; one of them is that it is hard to find basics like a well-fitted tee or running shoes. Another limitation is that you cannot get what you need immediately. However, there is a certain serendipitous nature to it; the right thing *always*, eventually pops up. I have bought everything from books that I have been meaning to read to Tabi socks( I do not know anybody besides myself who wears Tabi socks!) 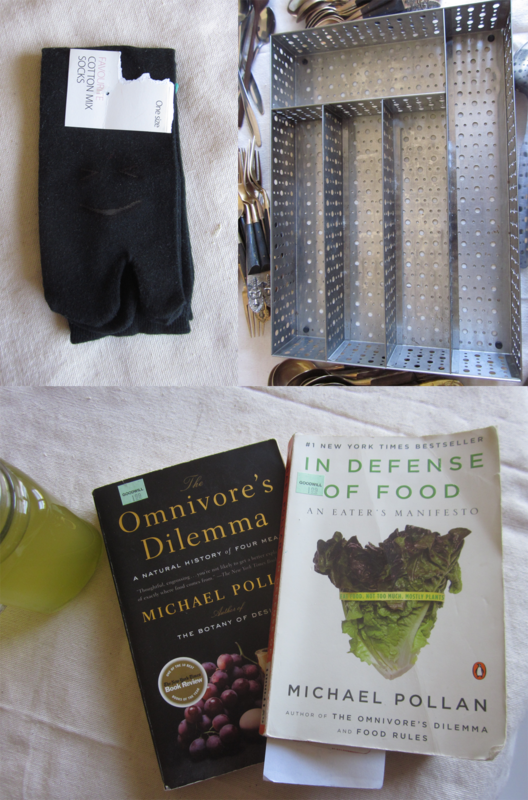 to metal utensil holder that I had been coveting on the zero waste home blog! Interestingly, thrifting has a very negative connotation with my Bangladeshi acquaintances. I was once offered cold, hard cash by my on-the-verge-of-a-breakdown-mother-in-law when she learned that my *new* winter coat was a $10 church sale purchase (which I then dry cleaned). At that point, I initiated a negotiation about how much she was willing to pay for my dumpster-dived treasures. In general whenever I’d mention an item bought at a thrift store or church sale or garage sale, I would readily be associated with being poor or miser or both , paired with a surreptitious glance of disgust, at which point I’d point out which one of the furniture was dumpster-dived, just to mess with their appetite. 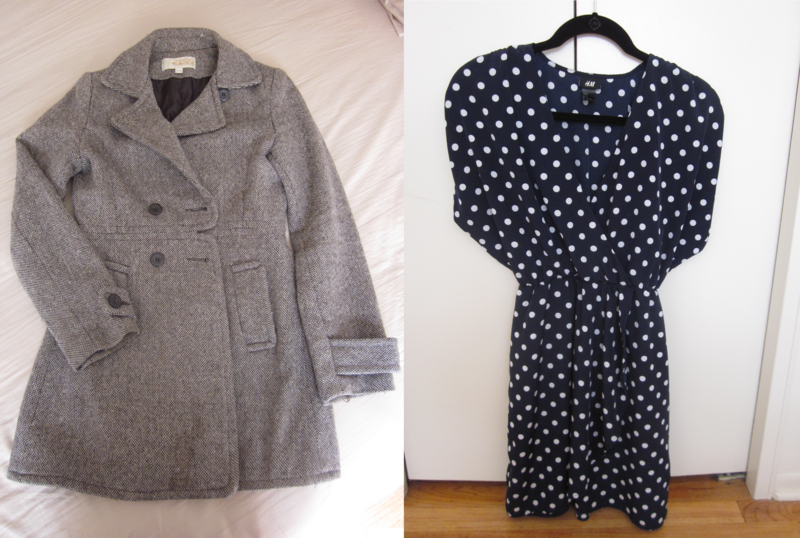 The cornerstone of Eco shopping is buying what is already there: the pre-loved. Both repairing and thrifting divert tons of stuff from the landfill. On top of being inexpensive, thrifting enables the shopper to afford better quality items (real wood versus sawdust furniture) and appreciate quality and craftsmanship in the process. Objects get fully utilized and re-circulated within the community before hitting the landfill or recycling center. In addition to being free of concerns like exploiting virgin material or excessive packaging, various ethical issues regarding wage, labor policy, manufacturing process, overseas shipping, political standing of companies are irrelevant in thrift shopping. Read Shopping in Less Disposable Living (Part II). Buying second hand things by the people ,who can well afford new things, is depriving the poor people who really cannot afford. And, there will be no growing industry (including cottage industry) causing less stores, less employment. At the same time it kills the habit of donating.